The life expectancy of an Emperor penguin is about 20 years. Your air conditioner isn’t quite as lucky. Its average lifespan is about 10 to 15 years. The trusted techs at Air Professionals will use all of their expertise and AC smarts to keep your existing unit running smoothly and efficiently for as long as possible with our top-notch air conditioning repair service. You notice inconsistent pockets of cool air from room to room. Your AC is frequently on the fritz. Your system uses R22 refrigerant. If you notice these or other problems that are preventing your igloo (or more traditional Central Jersey home) from staying cool, call Air Professionals. We have more than two decades of experience in air conditioning installation and replacement. Our techs are the coolest and our AC services are the hottest in town. When it comes to installing or replacing your system, you need professionals who know exactly what to do and when to do it. You need a team that won’t try to snow you into a replacement or installation when a repair to your existing system makes the most sense. But you also need experts who can examine your system from top to bottom and accurately assess when it’s time for your old unit to leave the colony. Our team has seen it all and done it all. Whether you need air conditioning installation in Hillsborough, Basking Ridge, Bridgewater, Flemington, Somerville or throughout Hunterdon, Somerset, Morris, Mercer or Warren counties, our cool NATE-certified techs are hot on the trail of recommending the make and model that is just right for you. This is critical because a unit that’s too small or too large for your space will not run efficiently, compromising your comfort and costing you money. When a unit is too small, it will run longer than it should and, despite all of the extra output, will fail to properly cool your space. When a unit is too large, it will short cycle and fail to effectively remove humidity, adding to your discomfort. Either way, you lose out. You end up paying more and getting less in return. Once you’ve chosen the make and model that best suits your needs, Air Professionals will glide on over to provide you with our outstanding installation services. Our techs have been trained to show the utmost respect for your home, leaving it in pristine condition when their work is complete. Increased energy efficiency. Your system’s Seasonal Energy Efficiency Ratio (SEER) is a measurement of the cooling your unit generates compared to the amount of electricity it uses. Units with higher SEERs are more efficient. Under current U.S. Department of Energy guidelines, newer units must have SEER ratings of at least 14. Upgrading to a new model could significantly improve your system’s efficiency. Lower energy bills. Systems that are more efficient use less energy, which means lower monthly utility bills. How cool is that? Greater comfort. New systems are much better at providing consistent temperatures throughout your home. Plus, they typically operate much more quietly. Ahhhh! So, allow Air Professionals to coast on over to your not-so-cool home to get the best air conditioning replacement in Basking Ridge, Flemington, Somerville, Hillsborough, Bridgewater, or throughout Somerset, Hunterdon, Morris, Mercer and Warren counties. We’ll hook you up with an energy-efficient, reliable, state-of-the-art system that won’t fail to deliver the cool relief—and peace of mind—you deserve. At Air Professionals, we’re so confident about our products and services that we back them up with a 100 percent satisfaction guarantee. If our work or products fail, we’ll return to fix it. 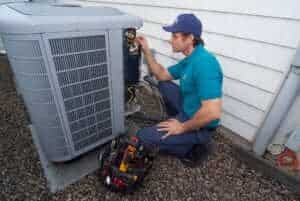 We also understand that an air conditioning replacement and installation project is a major expense. It can be a significant drain on the family budget. That’s why we offer affordable financing packages designed to protect you from feeling snowed under. Schedule your AC Replacement & Installation Today! We’re here to serve you! We offer free estimates for the replacement of an existing system or the installation of a new system. Call Air Professionals today at 908.238.3732 or contact us on the web.